The Make a Move Festival has a particular emphasis on social inclusion, healthy living and an alternative lifestyle approach for young people and especially those from marginalized communities. The festival also aims to celebrate and develop the art forms within the Urban Culture for young Limerick artists and audiences. The festival will be showcasing break-dancing/hip hop dancing, DJ/MC Performances and street art. The workshops will feature both local and international top talents in the Hip Hop world with Barry Burke (Bazzy B) together with professional dancer Tommy Gunns Ly (www.bboytommyguns.com) from the US. Tommy Gunns Ly is best known for his Hip Hop Dance Cru called Ill-Abilites, which is made up of dancers across Europe with various physical limitations. 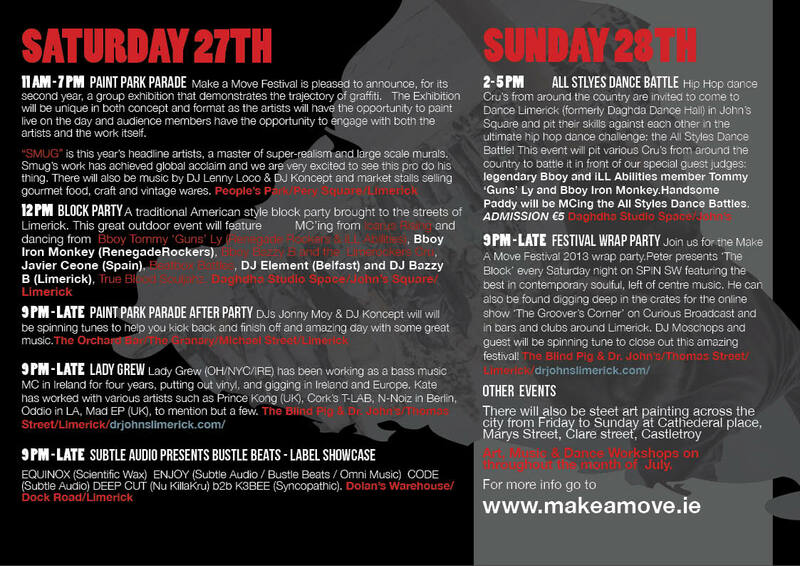 Make a Move will once again be holding its flagship Block Party event on Saturday 27th July on Thomas Street alongside the Park Paint Parade in the Peoples Park. Both events were enormously successful in 2012 and are back by popular demand. On Sunday 28th July the All Styles Dance Battle will take place at the Daghda Dance centre, and will feature numerous dance groups from across Ireland competing against each other. CAPTAIN MOONLIGHT – fresh off the Glastonbury Stage, Moonlight is performing in his inimitable style exclusively for Make a Move. Hailing from Kilkenny, Captain Moonlight first came to national prominence with his track Dirty C**ts which attacked and named the political elite. He released three albums between 2006 and 2010 collectively named the Agriculture trilogy. In 2013 he is recording a fourth album "Offences against the State" and played Glastonbury 2013. WORKING CLASS RECORDS Showcase – independent Dublin-Based Label featuring Street Literature. This is the first time the label will be playing in Limerick and Street Literature are a hip-group hip hop group from Dublin, They are G.I, Costello, 4Real and Moschops. SMUG is a Glasgow-based street artist specialising in characters and photo-realistic graffiti. Smugs paintings are meticulously rendered works which draw upon an eclectic range of influences often making uncomfortable subjects into stunning pieces on canvas and in industrial and abandoned settings. BLOCK PARTY on Thomas Street on Saturday July 27th. MCs, DJs, Breakdancers, Freestyle Footballers and more. An electric vibe will take over the city with artists like Icarus Rising taking to the mic. PARK PAINT PARADE – the annual art party will swoop onto People’s Park with over 60 artists taking to the stage to paint freestyle. Other attractions include market stalls, vintage wares, and music. ALL STYLES DANCE BATTLE at the Daghda Dance Space: County- vs County of truly awesome show featuring breakdancers taking to the stage against a backdrop of stunning DJs and MC’s. Judged by international superstars Tommy ‘Gunns’ Ly and Iron Monkey. One-of a kind event not to be missed with dance cru’s coming from all over Ireland.